The Town of Cicero received a Federal Grant to begin a program to replace the lamps in public street lighting using new LED technology. 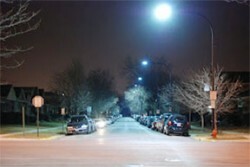 LED lights are white, and are brighter compared to the amber (or high pressure sodium) lights used by the Town of Cicero and most other Chicagoland communities. Town President Larry Dominick said the new LED lights will not only increase visibility and safety but also reduce costs by as much as 25 percent. The LED lights also reduce coal burning pollution because the LED lamps require lower energy to illuminate streets and with longer life expectancy, the LED lamps will require less maintenance. “When we can both save taxpayer money and also improve safety in our community, that’s good for everyone, including our senior citizens,” Dominick said. Dominick said eventually the LED lightings will replace all of the existing street lamps but he said the grant will permit the program to convert lights in Hawthorne, Drexel and four blocks on 60th Court and 61st Avenue near Roosevelt Road for a total of 120 of the Town of Cicero’s neighborhood blocks. More conversions will be approved once the Town can secure more funding.